Mixers - they are the link in each DJ set, which interconnects all devices and so completes the set. Regardless with or without inserted multi-effects, condition mixers or with rack installation rail, Battlemixer or 4-channel-Mixer. We always offer the correct equipment to you for the ideal use. Whether you are a beginner, advanced or professional - there is the right mixer for everyone. Mixing without a mixer is almost unthinkable, just like controlling a car without a steering wheel, because the mixer controls volume (Master Gain), volume of the different frequency ranges (Low-Mid-High) and additional functions. There are, however, many variations on the subject of mixing consoles - for example, there are inexpensive versions with 2 channels starting from about 100€, which cover the basic functions, up to 4-5 channel mixers with several functions and their own touchscreen display in the medium 4-digit range.. Which mixer is the right one? As a DJ mixer for beginners, a small mixing console with 2 channels is the best choice, because the many knobs and controls are definitely confusing and as a starter you lose the overview. 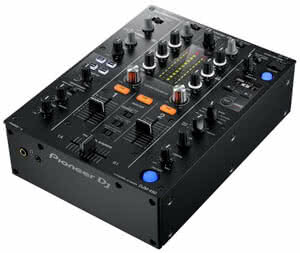 2 channel mixers with short crossfader are also suitable for battle DJs where the focus is on scratching. They are called Battle Mixers, because it depends on the speed with which the Corssfader can be moved within a short time. After some time many DJs decide to perform in front of an audience. It's worth upgrading on a mixer with at least 4 channels - this way you have more functions and music sources to play several songs or sections of songs at the same time. Many of our customers prefer a mixer from Pioneer. 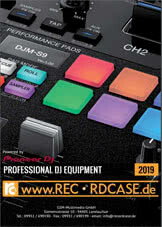 This manufacturer convinces with its high-end products and is used by the best DJs in the world. They have become the standard and Pioneer mixing consoles are available in every major club or event. The operation is logically structured and other manufacturers orient themselves on them. If you like it cheaper, you can choose a Behringer mixer. In addition to their low price, they are particularly convincing due to their high functionality and numerous features. In the premium segment, Allen & Heath mixers are available. They score points for their first-class sound quality, high robustness and high quality workmanship.